Your options are endless…these look beautiful with long julienned strips of carrots, cucumber, peppers, etc. in it. Just stuff it full of whatever veggies you have on hand, top with hummus or another dip and voila! These are also great with raw mock tuna or raw zucchini hummus. The great thing is…Bella liked it! It really is mild enough that she didn’t mind the raw greens in whole form. The only thing I will say is that because the leaves are so big, they do take up a lot of space in the fridge. You might consider cutting off the stems before you store them. They keep for a long time too…I’ve had ours for 2 weeks now and they are still good. Collard greens are widely available…so run out and get yours today! TIP: When you lay it out and before you fill it…use your thumb to press down hard on the center “vein” to break it/crush it from end to end. If you don’t you’ll have a really hard time rolling it. Crushing the vein will soften it enough to roll. Entry filed under: Fruits and Veggies, Greens. living in the South I have only had collards that are cooked all day with a big ol’ ham bone and vinegar!!!!!! That probably makes you cringe! It has never occured to me to eat collards raw…I might just have to try it. I went to the link on the raw mock tuna, but I’m curious to know if you make this without the juicer it mentions? I don’t have a heavy-duty juicer and just wondered if it’s possible without it. Aimee…yes, GROSS 🙂 But I did know that about the south. I’ve never had them any other way than raw though! Nicole…let me know what you think! I am going to go back and add a tip about rolling them…check back. Regarding the juicer…you don’t need it. Just put it all in a good food processor blend it until it’s super fine. It will be great that way too! I dreamt about shopping for collards after I read this last night. Is that a sign? 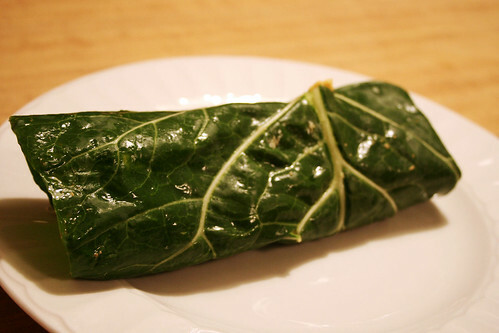 Collards are awesome – I use these all the time now for my “green burritos”! Like you, I’ve just reconnected and recommitted myself to a healthier diet, and right now, I am LOVING the combo of green smoothies for breakfast, my “green burritos” for lunch(or dinner for that matter, some more fruit during the day as snacks, and one healthy cooked meal(like veggies+rice, or a bean soup) per day as part of my transition. Way to go, and good luck with your raw adventure! http://www.RawFoodTalk.com has a great discussion board too – great for support, and already I’ve gotten a couple of cool-sounding recipes from there. http://www.goneraw.com is a stunning respository of raw recipes(some 1500)so there’s bound to be something there that you and your family will like! I’ve been thinking about trying collards for a while now but have been weary for some reason. i’m glad to hear they are mild. I’m going to pick some up! I’ve never tried collard greens but may have to try these! You know, I don’t know if I do, I haven’t tried any since I was young and didn’t. I love broccoli and cgabbae, so I just might, now. Collards were a huge thing in my family when I was growing up. When my Aunt was in the hospital a few months ago and didn’t feel like eating, I took her some collards and cornbread. That was the first thing she actually ate! oohh amie, that does not sound gross at all. I’m in the south too. (DEEP SOUTH La) and that hits right to home. I rarely ever claim anything southern because most of it is fried fat and unhealthy or tacky, BUT Collard greens are something I will always claim. Especially how you described them, cooked in a pot with a hambone! LOL. We always cut ours up in little strips so you can get em in your mouth. Those are some big greens. I like those better than mustards. As far as the vinegar, yep been there done that and it’s good eatin, but when we were young we used to put sugar on them too. Now I just eat em plan as long as there’s a big chunk of homemade cornbread that I can sop up the collards juice with! LOLOL. Oooh I am about to go put on a pot right now! They are a staple in my home so you know I have some stored away LOL. 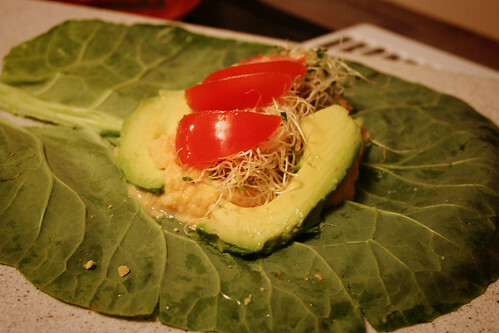 Also I REALLY like this wrap idea, I accidentally ate collards raw once because somebody mixed it up with the lettuces and I knew they looked familiar but thought it was something new. I didn’t find out until after I ate the whole salad that I just ate raw collards topped in veggies! LOL. And it didn’t kill me! hahaha. Yep I’m gonna save a few collard leaves for a wrap or two and see how that goes. Thanks so much for this new tip! This tastes so fresh and is so satisfying,you will want them all the time! Enjoy!